Looking for a tent that holds up in strong winds? Windy conditions are definitely something to consider. Because should you encounter strong winds when camping, you want to feel confident that your tent has the strength to remain standing (and not be blown down!). We’ve researched what aspects of a tent are important to handle heavy winds and will introduce you to the best tent for windy conditions. 93 x 55 x 40"
105 x 48 x 41"
40 x 60 x 93"
74 x 88 x 51"
First, let’s take a look at what aspects you will want to consider when looking for a tent that can handle significant wind. This is where pole design, body shape, whether a tent is single or double wall, the tent shape, ventilation, guy lines and tent material factor in to your choice of a tent. When it comes to the strength of a tent, the number of poles as well as how many times they cross are big factors. More intersections of the poles mean a stronger pole design. Other considerations in pole design are the number of clips and the material that will attach the pole to the tent. There are two very common designs; two poles that cross once in the center of the tent and four poles that cross intersect seven times. There are a myriad of variations of these two designs. Also of importance is the type of pole material and the pole’s diameter. Most poles are made of aluminum by the Dongah Aluminum Corp (DAC), though there are also aluminum or carbon fiber poles made by Easton. When considering mainstream tents, DAC Featherlite NSL green are considered the best aluminum poles available. Both single and double wall tents offer pluses and minuses. Double wall tents provide a breathable inner tent and an outer tent that offers protection from rain and snow. Double wall tents are typically warmer, stronger and more durable than single wall options. Single wall tents are usually lighter weight and are often easier to set up. In many cases they are more compact and better able to be pitched in small spaces. Note: If you'd like extra tips for keeping your tent warm, check out our guide here: ​How To Stay Warm In A Tent (6 Cozy Camping Tips). When speed and weight are most important or you plan to camp where space is extremely limited, a single wall tent is your best option. In most other cases the double wall will be preferable. Tents come in cabin-style and dome-style. Cabin style tents have walls that are close to vertical, providing more height so that you can stand up. Dome style tents, which will stand taller in the center but will slope down on the sides, are better able to withstand wind and are typically stronger than cabin style tents. When it comes to wind, a tent that is low to the ground with less surface area to push against will perform best. Ventilation is always important, however when cooler temperatures accompany wind, there are additional considerations. Our breath will release warm air, which will condense and freeze when it hits the cold tent wall and then drip into the tent. Ideally your tent will provide the airflow needed to take water vapor out of your tent so that it does not turn to condensation on your tent walls. Vents are considered to be better at reducing condensation than breathable fabrics, therefore a tent with more vents will be best for colder climates. Mesh panels are common in tent ceilings, doors and windows and their presence will improve cross-ventilation and keep condensation under control. Guy lines are ropes that attach to the rainfly of a tent and are staked in the ground. The guy lines will keep the rainfly from the body of your tent to reduce the likelihood of water leaking into it. They will also improve the stability of your tent so that in heavy winds or snow your poles won’t bend too much and possibly snap, causing your tent to collapse. Tents should offer guy line loops or tie-out points at the base of the rainfly as well as halfway up the rainfly along the pole seams. These loops are important as they will pull from the middle of the tent, achieving a good angle to keep the tent in place despite heavy winds. Check out the video below to learn more about how to set up your guy lines. There are numerous types of materials in tents. Generally, nylon will be stronger than polyester and both will require coating in order to be waterproof. Denier is the term used to measure the fiber thickness in individual threads in cloth. 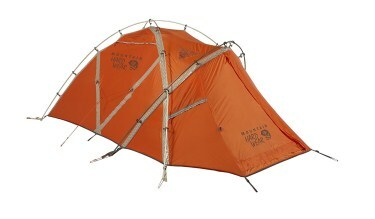 When you notice denier (D) in the tent specs, it is letting you know the fabric yarn’s weight in grams. A higher denier means a more durable fabric and a lower denier means a lighter and less durable material. Now that we have an idea of what to look for when seeking a tent for windy conditions, we will introduce you to six top rated tents and review their features so that can you choose the best option for you upcoming adventures. When considering strong tents for extreme weather, we will first take a look at the Hilleberg Jannu. 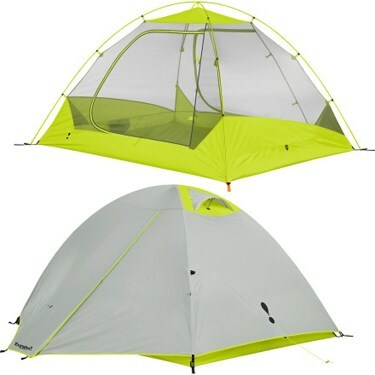 This 4-season, 2-person tent is spacious with 34.4 square feet of floor space and a peak height of 40 inches. It is lightweight for a four-season tent with a minimum weight of 6 pounds 2 ounces and a packed weight of 7 pounds 1 ounce. The tent has one entrance as well a 12.9 square foot vestibule for gear storage. This tent by Hilleberg is dome shaped and includes 9mm poles made of DAC Featherlite NSL Green that cross at multiple points (3 poles intersect 3 times). This will help with tent stability when encountering winds from all directions, as well as handling snow. The outer tent's walls are able to extend to the ground to offer additional protection and ensure your comfort. Next up: Mountain Hardwear’s EV 2 Tent. A 4-season tent, the EV 2 offers 31 square feet of floor space and a peak height of 41 inches. You can't have a conversation about the best tent for wind and rain without bringing up Black Diamond Fitzroy. 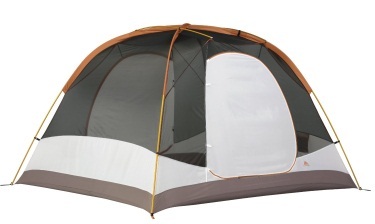 This 4-season 2- person, dome style tent offers 36 square feet and a peak height of 40 inches. This tent has a minimum weight of 6 pounds 4 ounces and a packed weight of 7 pounds 1 ounce, very similar to the Hilleberg Jannu. There are some differences between this tent and the Jannu; this tent is a single wall option, it offers two doors and the 9 square foot vestibule is optional. The Fitzroy by Black Diamond has four 8 mm poles made Easton Aluminum 7075-E9 with 7 intersections, which is great for stability in windy conditions and 20 rainfly pole clips help enhance the tent’s strength . The single wall fabric is ToddTex (a waterproof, breathable three layer Teflon laminate) and double doors with internal mesh panels help with ventilation. For 4-season family camping the Big Agnes Flying Diamond 6 has a lot to offer, starting with 90.5 square feet of floor space. This free standing tent has a minimum weight of 18 pounds 11 ounces and is ideal for car or base camping. Two vestibules at 26.5 square feet offer space to store your gear so that you can use all of the floor space to stretch out. With a peak height of 5 feet 6 inches, this tent offers enough headroom to be comfortable without so much height that you worry it will hinder its performance in windy conditions. This dome shaped tent has six DAC Combination Lightweight Aluminum poles that are made from TH72M aluminum. With a diameter of 11-13 mm, the poles are designed with durability and strength in mind. The tent body is made of a breathable polyester rip stop with nylon mesh windows, while the floor and fly are both made of polyester rip-stop and have a waterproof polyurethane coating that will improve your tent’s durability and keep water out. Next, let’s take a look at the Kelty Trail Ridge 6. It is a 3-season, dome shaped tent with 82 square feet of floor space and a peak height of six feet. This tent is significantly larger than the previous options reviewed and heavier, with a minimum weight of 12 pounds and 3 ounces and a packed weight of 15 pounds 10 ounces. 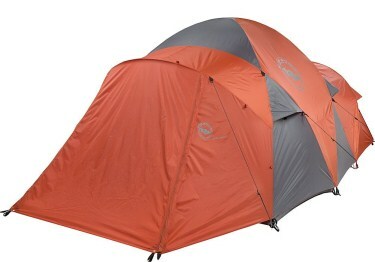 This two door tent by Kelty offers two vestibules at 17 square feet each. The wall and fly of the Trail Ridge 6 are made of 68D Polyester, offering strength in high wind conditions. Three poles made of DAC DA-17 stabilize this freestanding, 2 door tent and mesh panel walls and fly vents ensure that there is good ventilation when your tent is in use. If you're interested in 3-season tents, the Eureka Midori 3 is a solid option. Able to sleep three, this tent offers 45.2 square feet of floor space with a peak height of 51 inches. Its minimum weight of 6 pounds 8 ounces means that it is not overly heavy and can be used for backpacking or a basecamp adventures. Two vestibules provide ample space for gear storage at 10.9 and 11.8 square feet. This freestanding dome shaped tent by Eureka offers their new V3 Enhanced Tent System which includes enhanced ventilation, a full coverage fly and guy-out design features that will protect the tent (and you) from inclement weather. The 75D polyester rain fly and 75D polyester taffeta floor offer durability and the strength needed to hold up in high winds. This two door tent offers mesh walls that allow for excellent ventilation. Two shock corded aluminum poles with a diameter of 9.5 mm offer good support and easy set up. 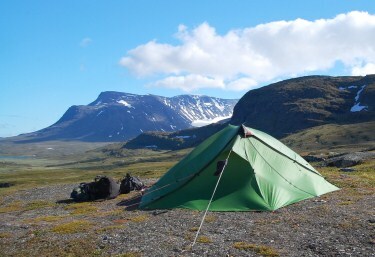 While all six tents reviewed have a lot to offer, the Hilleberg Jannu is our top choice. This 4-season tent offers enough room to sleep two comfortably with 34.4 square feet of floor space and while it has the strength to withstand harsh weather like heavy winds and snow, it is very light with a minimum weight of 6 pounds 2 ounces. DAC Featherlite NSL Green poles cross at multiple points for additional strength and the guy line points offer a webbing extender that wraps around the poles ensuring that the tent's stitching is not stressed, even in strong winds. This feature is key in the durability of the tent. While Black Diamond's Fitzroy and Mountain Hardware's EV2 also offer the the strength needed in the most challenging of weather conditions, neither performed as well as the Jannu in the warmer months. The Flying Diamond by Big Agnes does well year-round, however it is much heavier and lacks some of the features that lead to our confidence in the Jannu. 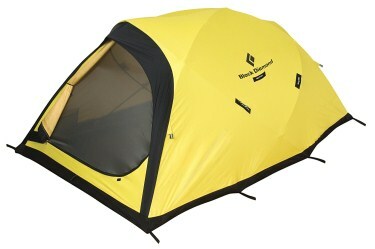 If you're looking for the best wind tent, we recommend getting the Hilleberg Jannu; it's our top choice.